Bangkok (Thailand) – August 29, 2018 (travelindex.com) – As an ambassador of French elegance, Sofitel links its collection of addresses with gastronomy, and collaborates with renowned wineries. In each of our unique hotels we showcase art and culture, and introduce our guests to French art de vivre and wines of the world. Sofitel Wine Days is a season of special wine tastings and events held at Sofitel hotels around the world. At Sofitel Bangkok Sukhumvit, you can discover our all-new 2018 edition of ‘Sofitel Wine Days’ – a celebration of the unique culture and winemaking heritage of France. Held from September 21st to October 31st, the traditional wine harvest period in France, this year’s ‘Sofitel Wine Days’ program is in a class of its own. This year the Wine Season will be taking place around the Wine Boutique located in the hotel lobby, the space plays host to a tasting room, wine cellar, shop and tapas bar, open daily from 11am to 11pm with a wine sommelier ready and waiting to take you on a journey through the fantastic wine regions from across the globe. 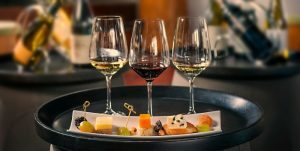 An Industry night will be held every Wednesday starting with the 26th September, the first in a series of exclusive Wine and Cheese evenings for hoteliers and hospitality sector professionals. Each evening features selected new wines from countries such as Spain, France, Italy, Germany and South Africa. The wines are served each week with tasty artisan cheeses and tapas. Every Wednesday From 7pm to 9pm and priced at THB 990 net. On Saturday 6 October, the Sofitel Wine Days programme features two major events. The Wine Fair, back for its fourth year will be held from 2pm to 6pm in the hotel lobby and at the wine boutique. The fair will include showcasing new arrival wines to Thailand as presented by some of Bangkok’s leading wine suppliers including Valentines wines / Vanichwathana / Wine Dee Dee / G four / Teixca / BB&B / Wine Gallery / IWS / Italthai/ Wine Pro and food suppliers Classic Fine Foods, Fresh Direct and Jagota. The afternoon will feature complimentary tastings and wines available for purchase at wholesale prices. This special Sofitel Wine Days continues on 6 October with an Oysters and Wine evening from 6pm to 9pm at Wine Boutique. Fresh oysters Majestic / Utah Beach / Marenne D’Oleron (fine de clair from Ireland and France will be served with carefully selected wines from vineyards in Spain, France and South Africa including LePetit Cochonnet Pays d’oc Grenache Rose – France, Oude Kaap Western Cape Chenin Blanc – South Africa, Bodegas Piqueras Black Label Almansa, Syrah, Monastrell – Spain and many more. Saturday 6th October, 6pm to 9pm Priced at THB 1,350 ++. On Saturday 20 October the hotel presents an exciting opportunity for wine lovers to attend a very exclusive ‘Five Continents’ Dinner Party featuring carefully selected labels and cuisine from around the globe. Executive Chef Mark Hagenbach’s menu includes highlights of Smoked Duck “Boerewors” Fried Polenta, Chanterelles paired with Bellingham The Bernard Series Chenin Blanc – South Africa, and a Tasmanian Loin of Lamb, Pettit pois, wild Garlic, Anchovies, Tomato Tart paired with Mitolo Jester McLaren Vale Shiraz 2016. The dinner and wines will be served at a long table seating all 20 guests in the style of a traditional at-home dinner party, The décor at Wine Boutique, coupled with the top quality food and wines, will ensure that this will be a truly memorable and spectacular event. On Wednesday the 31st of October the Sofitel Wine Days season will conclude with a final event with special guest Joan Carreras Asia Pacific & Middle East Director, who will present their DOMO brand and philosophy highlighting the amazing variety of wines produced in the province of Valencia in Spain. The featured wines will be served with artisan cheeses throughout the evening. Wednesday 31st October, 7pm to 9pm Priced at THB 990 net. Sofitel So hotels are new « boutique hotels » characterized by a stylish focus on contemporary design by famous architects and/or embellished by international celebrities from the world of fashion, design or art: Sofitel So Mauritius Bel Ombre, Sofitel So Bangkok and Sofitel So Singapore.